You must have noticed that price of gold has risen sharply in this millennium. Gold has beaten almost all asset class including equity and mutual funds. If we see history gold has provided 16.91 % annualized return over the past 10 years. 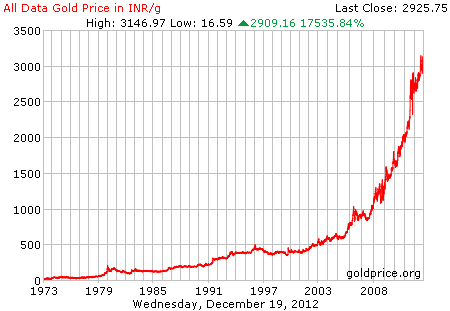 In last 5 years since 2008 the gold prices have risen more than 150% (Rs. 12500/- to Rs. 32000/-) making a strong case for having it in your portfolio. The percentage allocation to gold should depend on an investor’s risk and return objectives. Before talking about future return of gold let us look at historical graph given below which shows gold has given continuous appreciation over the decades. This may be because everyone believes that gold is yellow shining safe heaven & continue to grow forever. Looking at returns you must be thinking that this upward trend in gold price will continue or how will the price of gold develop in 2014 and in the following years? Let’s try to a look into the future. In order to forecast this we have collected various data & information from various agencies. This forecast is for giving you overview about future gold price we cannot assure that this will be completely accurate. As it is the case with any other freely tradable goods, the price of gold is determined by the demand for gold and the supply of gold. The demand for gold comes from four areas: the jewelry industry, investment, the industrial demand and demand from central banks. In 2011, almost 44% of the gold on the market was demanded by the jewelry industry. The second largest demand factor was the investment demand of the private sector with a 35% share of the total demand. It should be noted that, particularly in the Middle East or Asian countries gold jewelry is often used in fact as a form of gold investment – and not only or primarily as jewelry in the original sense. In these parts of the world, the price of gold jewelry with typically high purity is often close to the value of the gold which is contained in the jewelry. The gold jewelry is easily tradable and traded at a fair price and are therefore suitable as a substitute for investment gold. 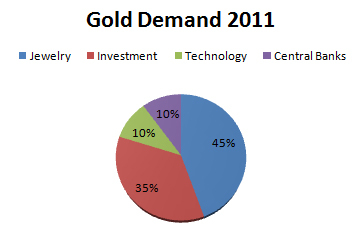 However, the share of the industrial demand for gold, for example from the wire technology or from dentistry & share of central banks in the total gold demand are only about 10%. It is very difficult to forecast the demand for gold for 2014 and the coming years. The supply of gold generally consists of the amount of gold mined annually and the amount of recycled scrap gold coming back into the gold circulation. 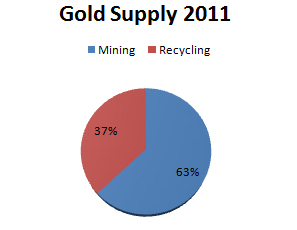 Gold supply was 63% from Mining and 37% from Recycling. Due to the many supply and demand factors and their interdependencies, a reliable forecast of the future price of gold in 2013, 2014 and beyond is very difficult. 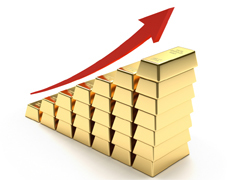 Below, we discuss possible scenarios and trends and their potential impact on the gold price. The financial crisis has led to a sharp increase in demand from private investors and central banks. If the uncertainty persists or perhaps even escalates again, this could drive the gold price further up, for example in case of a possible euro-exit of Greece or an escalation of debt problems in the United States or Japan. One argument of Western investors for the purchase of gold is the fear of high inflation and thus a loss in value of the money. In the wake of the debt crisis and the measures to ease monetary policy, this may be a legitimate concern, however, inflation has been very low and some experts in the short term even expect deflation rather than inflation. In emerging economies, such as China or India, however, the situation is different: in those countries, the respective inflation rates are high by our standards – sometimes even in the high single or double digits. This is not due to the debt crisis but to the high economic growth in these countries. Unlike in the developed economies, in China and India, in case of a positive economic development, a strong investment (and jewelry) demand for gold is expected. Latest gold price prediction by analyst for the years 2013 and 2014 differs, but seem to be mostly positive. Some forecast may seem to be speculations but one thing is for sure that from here gold price are intended to appreciate more. This may be due to economic uncertainties or may be due to high investment demand. I think that gold price will continue to rock in 2014 & beyond. Invest in gold today for brighter tomorrow. Gold will set record high in future but when that time will only show us. I really agree on your thought “Reliable forecast on price of Gold in 2014 is very tough”. As per me Asset allocation in Gold should not increase from 10-15% at the most. Many Indians are mad after gold! Many blindly want to invest in ETFs as much as 50% of what they can invest? Why invest in something that slowly increase all the time unlike equity which offers you chances to invest at lower levels?